Diamonds have a long – and sometimes messy – history of fascinating us. Coveted for their ability to fracture light and scatter it across a room in a display of technicolor wonder and their dazzling brilliance, it’s no surprise that we’ve been so utterly captivated by this natural marvel. With it’s exquisite deep blue coloring – to mention nothing of the supposed curse that shrouds it’s owners – The Hope Diamond could be one of the most famous diamonds in history. With a list of proprietors that range from Kings and Queens to Lords and American High Society, this fancy grey-blue gem has been handled by the kinds of people that stories are, and have been, made of. Legend suggests that the gem was stolen away from an Indian idol… and that it may have a mate. Another hints that it was bought from a slave. 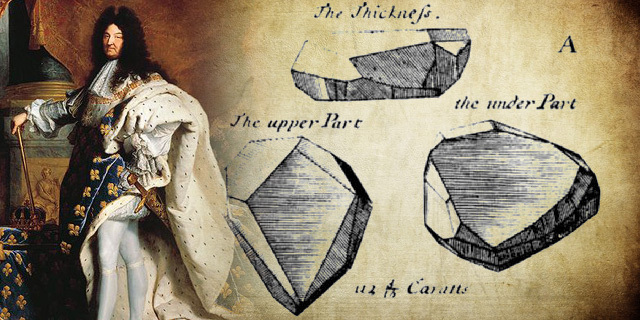 The most widely accept explanation of how the original 112 3/16-carat diamond came to be owned by Jean Baptiste Tavernier, sometime in the 17th century, was that he bought it from the Kollur mine in Golconda, India. Sold to King Louis XIV of France in 1668, the king commissioned the court’s royal jeweler, Sieur Pitau, to recut the blue diamond to better displace its brilliance. At it’s new weight 67 1/8-carats, the “French Blue” would make its trek through French history – leaving blood and misfortune in its wake: as curses have tendency to do. The captivating blue diamond would eventually pass through the hands of Nicolas Fouquet (imprisoned by Louis XIV for embezzlement, he’d die in prison 15 years later), then Princess de Lamballie and Queen Marie Antoinette (both of whom were guillotined during the French Revolution). In 1792 the “French Blue” was stolen during the looting of the French Crown Jewels during the Revolution. It wasn’t until 1812 that the blue diamond would resurface. While significantly smaller than the “French Blue” at 44 ¼-carats, evidence suggested that this was – in fact – the “French Blue” recut. Another king, George IV of England, is said to have purchased the diamond next. After his death in 1830, the blue diamond was sold to help cover the king’s massive debts. Having its fill of royalty, the diamond would be sold to Henry Philip Hope in 1839. Renamed The Hope Diamond, the blue gem would eventually pass to Henry Thomas Hope and later to Lord Francis Hope. Lord Francis Hope would sell the Hope Diamond in 1901 to cover his debts. The Hope Diamond would be sold to Joseph Frankels and Sons of New York City; who later sold the diamond to cover their debts. Selim Habib was the next owner of The Hope Diamond. As fate would have it, the wealthy Turkish diamond collector and merchant drowned when the French mail steamer Seyne wrecked in Singapore in November 1909. “This adds another to the list of misfortunes associated with the ownership of the famous gem.” Reads a line from an article about the wreck in the New York Times. As many fine gems and pieces of jewelry tend to do, The Hope Diamond eventually found its way to Pierre Cartier in 1909. Washington D.C.’s Mrs. Evalyn Walsh McLean would purchase the blue diamond in 1911. 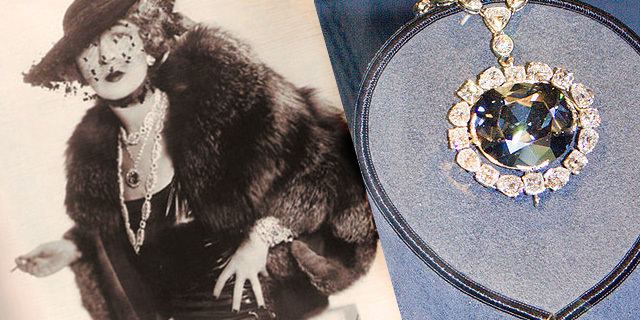 Likely one of the most well known owners of The Hope Diamond, Mrs. McLean was a socialite with a kind heart and lavish tastes who was famous for her D.C. parties – where she was often seen wearing The Hope Diamond. A series of tragedies seemed to have followed Evalyn after the purchase of the diamond. First the death of her 9-year-old son in a car wreck, later the death of her 25-year-old daughter by a sleeping pill over dose, even the infidelity and divorce of her husband has been linked to the diamond. With these terrible coincidences befalling a woman known for throwing parties for war veterans and trying to aid detectives in finding the Lindbergh Baby by placing a mortgage loan on one of her properties to help fund the search (eventually needing to pawn The Hope Diamond and other jewels – which she later reclaimed – to cover the loan), it’s no surprise that the world saw The Hope Diamond as ill-fated. 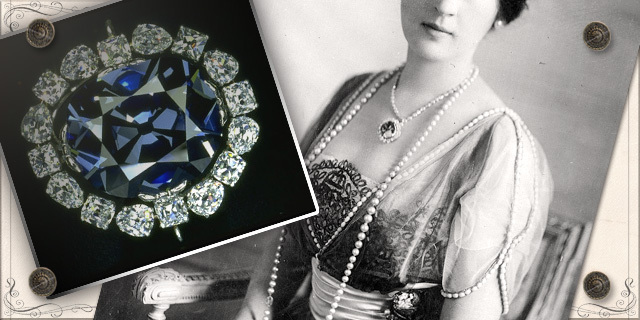 After Evalyn’s death in 1947, despite her wish to pass the gem to her grandchildren, The Hope Diamond would be sold to cover the debts against her estate. Henry Winston would be the last private owner of The Hope Diamond, which he purchased along with Evalyn McLean’s entire jewelry collection. After exhibiting the blue diamond in the “Court of Jewels” tours that traveled across the United States and Canada, Winston was approached by the Smithsonian. George Switzer, a Smithsonian mineralogist, is given credit for convincing Henry Winston to donate The Hope Diamond to the Smithsonian. On November 10, 1958 Winston sent The Hope Diamond to the Smithsonian via U.S. Mail wrapped in brown paper and insured through registered mail for $145.29. In 2005, after a year of research, the Smithsonian published their work officially acknowledging that The Hope Diamond is part of the French Blue crown jewel. 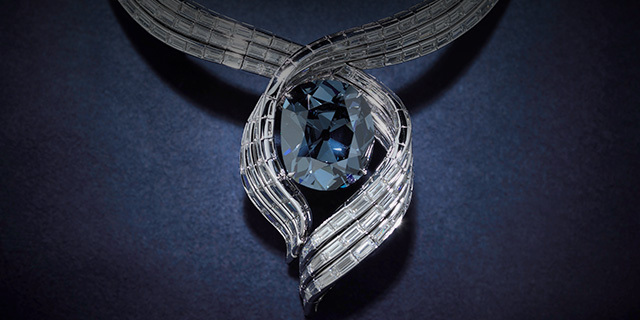 Despite its occasional setting change; as a loose stone 2009, and later in a unique platinum necklace called “Embracing Hope” in 2010 through 2012, The Hope Diamond is still the Smithsonian’s most visited exhibit. “Embracing Hope” is a temporary, custom designed platinum necklace that boasts 300 baguette diamonds (over 60 carats in total weight) and was created to commemorate The Hope Diamond’s 50th year anniversary at the Smithsonian. Regardless of its setting, its location, its owner, or even the validity of its curse, The Hope Diamond is a breathtaking work of natural art and has become a legend that time itself would be challenged to lose.